Are you looking for a CheckoutSmart sales, discount, voucher code or deal? Here are the best shared by our community of bargain hunters. Great Testing Drink Full Cash Back. 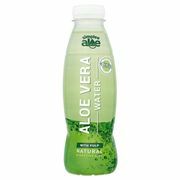 Aloe Vera Water with Pulp 100% CashBack. Hemp Water Full Cash Back. Oppo Ice Cream 75p after Cashback from CheckoutSmart at Asda. CheckoutSmart is a fun and easy way to make your supermarket shopping more rewarding - whether you shop in-store or online. It is a game-changing app that enables FMCG brands to connect directly with supermarket shoppers before, during and after their shop. With their digital solution, there is none of the hassle and slowness of paper coupons. Smart millennial shoppers don’t want to print out pieces of paper at home; instead they expect their interactions to be personalised, fast and digital. In order gain exclusive access to offers from your favourite brands, you have to sign in and become a member online. Just buy the featured products, then upload a copy of your receipt or delivery note - that's it! Each member may only have a single CheckoutSmart account for their own personal use. Get cashback paid into your bank or Paypal account for buying products you love! Where there are multiple members in a household, no more than two member accounts may be linked to a single payment account (BACS/PayPal). Here at Latest Deals we have provided a great way for smart shopping as well! Here you will find the best and the hottest CheckoutSmart sales, offers, deals, voucher codes and promo codes. Every month our massive community of bargain hunters are always on the lookout to find the best possible deals around to post and share to our members. Want more cashback? Better checkout our latest deals for Quidco! What does Checkout Smart sell? Simply buy the featured products and then upload a copy of your receipt or delivery note. Once they’ve processed your receipt, they will send you an e-mail confirming the reward and you'll see this in your account. Use the CheckoutSmart app every time you shop and you could save hundreds of pounds a year. To upload a receipt, sign in to the app and then tap the bright red "CLAIM" button which is located at the bottom of your screen. You'll be guided through the upload process from here. You can redeem multiple offers with a single receipt. However, each receipt may only be uploaded in claiming an individual offer a single time across their network which includes CheckoutSmart, cashback sites, brand sites and other partners. How many offers can I claim? Some of their offers are available to claim only once, but many can be claimed multiple times. The number of times each offer can be claimed varies, and this is confirmed in the terms & conditions of each offer. Tap on any offer in the "See offers" section to see the full terms & conditions relating to that offer. You can claim as many different offers as you like. Please note however that each member may only have a single CheckoutSmart account for their own personal use. If you are claiming multiple offers on a single receipt, you only need to upload the receipt once, but ensure you confirm the offer and the number of times you’re claiming that offer when asked during the upload process. Offers which require multiple units to claim (eg Buy 2 etc) must be purchased in a single transaction on a single receipt. How do I contact Checkout Smart? You can contact their support them by emailing them at emailing help@checkoutsmart.com. Alternatively, you can send them a message using their Online Contact Form. What are the delivery options for Checkout Smart? You have to check with the retailer's available delivery options and costs for the items you want to purchase. How do I return an item to Checkout Smart? You have to check with the Returns Policy of the retailers for the item(s) you want to purchase. As soon as your balance meets the Minimum Payment, you can choose to receive this amount transferred directly into your bank or PayPal account. Your bank account must be registered in the UK, and must accept BACS transfers. Keep in mind that each member may only have a single CheckoutSmart account for their own personal use. Where there are multiple members in a household, a maximum of two member accounts may be linked to a single payment account (BACS/PayPal). To receive a payment, select "Change my details" from the menu screen and enter your account details. Their payment process is completed on Thursday each week. So if you request your payment on Wednesday, it should be processed the following day but if you request payment on Friday it will be processed the following Thursday. A processing fee of 5% is incurred when transferring amounts up to £19.99 to your bank or PayPal account; transfers of £20.00 or more incur no processing fee.